FOR many years, the National House Buyers Association (HBA) has been urging the Government to take measures to stem the steep rise in property prices to avoid a “homeless generation” as current property prices are far beyond the reach of many low and middle-income families in urban and suburban areas. This is a ticking time bomb that will result in many social problems if left unchecked. This is because, typically, if the property is purchased directly from the developer, it takes two years (for landed properties) and three years (for strata properties) to be completed. Hence, under the previous RPGT, speculators could purchase properties from property developers upon their launch and then flip these properties on completion (after two years) and having to pay 10% (i.e. within the 3rd to 5th year). 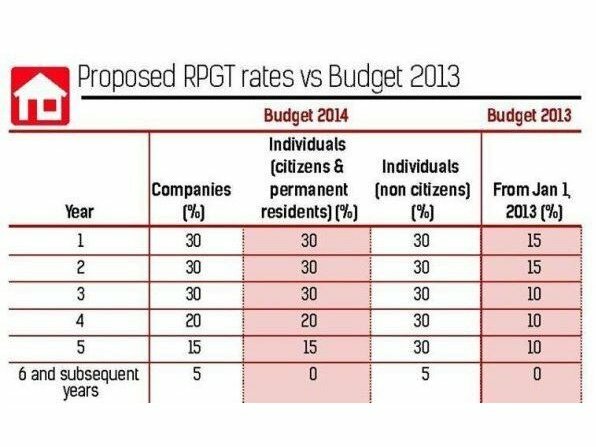 It is hoped that the revised RPGT rate will deter speculators and, at the same time, not punish genuine house buyers who buy for their own stay or long-term investment. It is worth noting that buyers of residential property could seek a once-in-a-lifetime exemption from the tax. Budget 2014 is best described as an “excellent mathematical formula” to curb the unbridled escalation of house prices, which has in the last three years skyrocketed. The Government has taken a step in the right direction with measures to slow down the steep rise in property prices due to false demand caused by excessive speculation fuelled by easy housing loans and the previously low RPGT. HBA applauds the move to increase the minimum price of property that can be purchased by foreigners from RM500,000 to RM1mil. Foreigners must be prevented from “snapping up” property meant for the lower and middle income. creates a domino effect which can result in higher property prices across the industry. This is especially true for development corridors such as Iskandar Malaysia which has seen foreign purchasers arriving in droves and scooping up properties with their advantageous exchange rate. DIBS is popular with speculators as they pay nothing to make a profit. Their initial down-payments and deposits are sometimes factored into the purchase price by the collusive developers, and some unethical financial institutions do not even require that the developer collect the deposit that has to be paid by the so-called purchaser. DIBS encourages speculation as the house buyer does not need to “service” any interest/instalment during the construction stage. This will “lure” and tempt many house buyers to speculate and buy into DIBS projects hoping to flip on completion and make a quick profit with little or no capital upfront. Connivingly, the interest element is “serviced” by the participating developers. DIBS artificially inflates prices as all interests borne by the developer are ultimately imputed into the property price. This in turn creates a domino effect which pulls up property prices in surrounding locations. Bank and financial institution staff conniving with developers using the DIBS model should be investigated on their “modus operandi” in financing those artificially inflated prices (DIBS + sales price) and ignoring guidelines on prudent lending. Banks and financial institutions are to be prudent and only provide mortgage financing up to the fair value/market value of the property. In this respect, a benchmark of fair value or market value is the current properties available. Somehow, properties sold under DIBS are always priced much higher; 15% to 20% higher compared with those without DIBS.